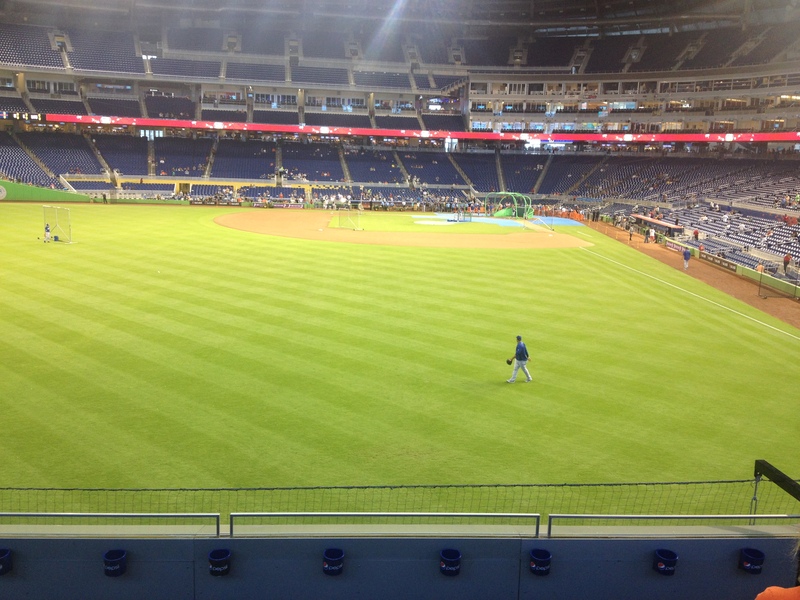 Last week I had the opportunity to go to Marlins Park for the first time. This was also one of the rare opportunities when my wife went to a game with me. My wife doesn’t hate baseball, but she also doesn’t go out of her way to see it. 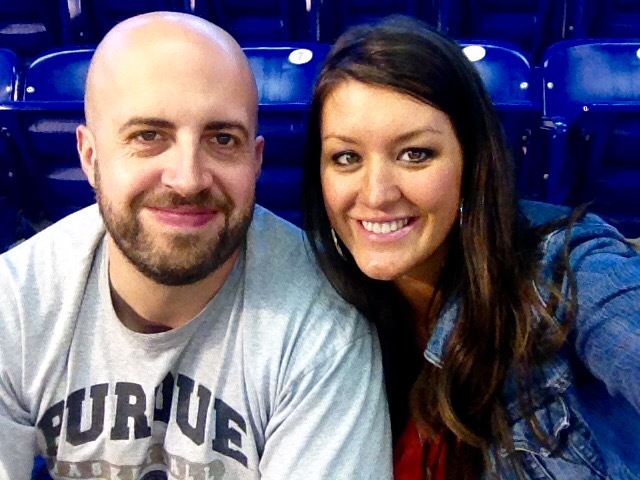 I wanted her to have a good time so I needed a few things to go just right: hopefully we’d get to see an exciting game; a good atmosphere wouldn’t hurt; and I’d heard good things about the food. There was one major selling point I had leading up to the game though: “You’re going to get to see Giancarlo Stanton!” I thought for sure that the opportunity to see one of the best players in baseball would win her over. We got to Marlins Park at 5:30 for a 7:00 start. If you’re taking someone to a game who isn’t that interested then getting to the park this early might not be a good idea. I noticed a couple things once we got there — you can tell as soon as you arrive that the park is new, nice, and clean (we had an easy time getting to the ticket window and picking up two seats for the game); and that there were WAY MORE Dodgers’ fans than Marlins’ fans outside the stadium. I figured maybe the Marlins’ fans would show up later, but that didn’t really change throughout the night. But by far the best part about Marlins Park to me was the beautiful roof on the stadium. Miami is hot and humid. I hate both of these things. I hate the beach. I hate sand and the sun, but when the roof is on Marlins Park it is a perfect 70-75 degrees. You don’t spend the first few innings of the game praying for the sun to go down. You don’t have to worry about an unexpected rain shower. This might be a personal quirk, but I’d be fine with every MLB stadium having a roof over it. Marlins Park was an oasis away from the hot Miami sun, and for that reason I was already in love with it. The “museum” is a large case of bobbleheads with every team represented. The case actually softly shakes from time to time to keep everything bobbling. We spent a few minutes walking around the case and then I had this unexpected conversation with my non-baseball fan wife. Wife: Who is Mo Vaughn? Me (very surprised to hear my wife say that name): Why do you ask? Wife: Was he really happy? Me: I’m not sure I can answer that. I wasn’t sure why my wife was asking this existential question about Mo Vaughn’s happiness and then it clicked. 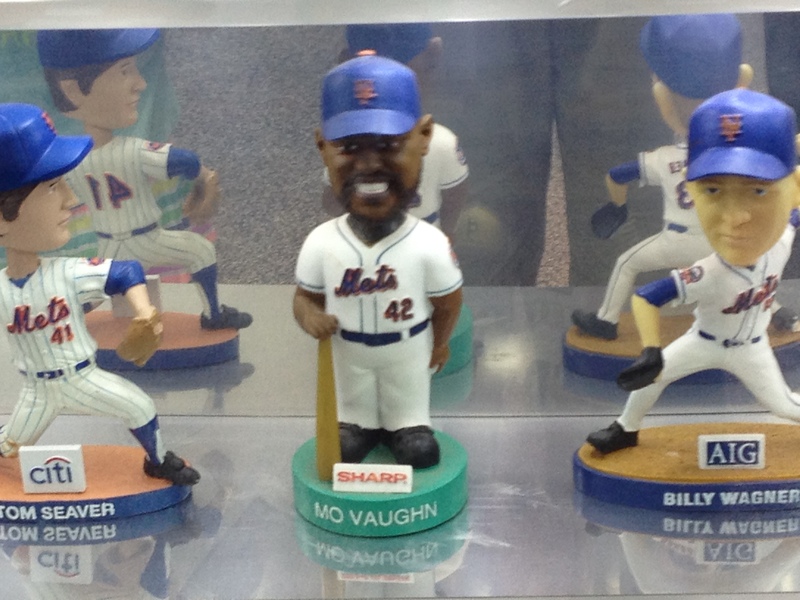 Mo Vaughn has a very happy bobble head in the case. We headed to our seats for the start of the game. One of the highlights of the night is that we set next to a guy named Mark and his girlfriend. Mark was from London and this was the first baseball game he had ever attended. His girlfriend was Hungarian and she too was attending her first MLB game. We struck up a conversation prior to the game starting and I could tell from the outset that this was going to be a long night for Mark. Mark: So where is everyone? Will the stadium fill up soon? Mark: When do we sing “Take Me Out to the Ball Game”? As a side note, Mark was VERY excited about the 7th inning stretch. He asked about it several times. I didn’t have the heart to tell him that it probably wasn’t going to live up to his surprisingly lofty expectations. The recorded attendance at the game was just over 21,000. I feel comfortable saying that there were fewer than 21,000 people at the ball park that night. I was shocked at how small the crowd was. It was a Friday night. The Dodgers were in town. One of the most exciting players in baseball plays for the Marlins. I was expecting something of a crowd. I was sitting in the outfield and probably could have had a conversation with someone sitting along the third base line if I barely raised my voice. The turn out was depressing, the atmosphere wasn’t great, and Mark was slowly coming to the realization that this wouldn’t be like his football matches back home. It was fun watching with someone who had never really seen a baseball game. He had a question during every at-bat and I was happy to answer. I was actually surprised to discover that it wasn’t just Mark who had trouble with the concept of tagging up. Almost everyone close to me had never heard of that before. Some of these people were in Marlins jerseys. Apparently we need to do a better job of educating others on this point. Let me just get this out of the way: It was a boring game. The Marlins didn’t put up much of a fight. The Dodgers led 6-1 by the fifth and you could tell it just wasn’t the Marlins’ night. I still had one hope for excitement for my wife, Mark, and everyone at the game: Giancarlo Stanton was playing tonight. I showed everyone close to me where Stanton had hit his farthest home runs in the park. I talked about the reasons he earned the mammoth salary that he did this past off season. If anyone could make this night exciting for non-baseball fans at the park it’s Giancarlo. So what did he do? Mark wasn’t around for Stanton’s last at bat. By the time he struck out in the third I think he was having a hard time believing that this was one of the best players in baseball, but that’s one of the hard thing about this game for non-fans. If you go to an NBA game you’re going to see a star do SOMETHING. They might not have a memorable performance, but you’ll get to see them a lot. At an MLB game you’re seeing the best for a few minutes at a time, and there’s a decent chance they might not be able to do anything. We’d come to find out later that night that Stanton had actually broken his hand during one of his at bats. Stanton’s hand was broken, my heart was breaking, but at least Mark had “Take Me Out to the Ballgame” to look forward to. The top of the 7th ended. One of two people in our section stood up but the majority stayed sitting. I leaned over to Mark, “This is it.” He popped to his feet ready to hear the gathered crowd belt out this song like his fellow Liverpool supporters sing “You’ll Never Walk Alone” prior to each match. A few people sang. Most people didn’t. Mark looked around perplexed. The song ended. He turned around and asked, “That was it?” That was it. It didn’t surprise me that in the bottom of the 7th Mark stood up, turned around, shook my hand and uttered a heart felt “good luck.” I think he felt bad that there was still more game I had to endure. Sadly I don’t think this game piqued Mark’s interest much. If anything he left bewildered at the lack of excitement in this shiny new stadium. I think the night encapsulated the state of the Marlins well. I completely understand the fans not buying in. The team hasn’t been great, but beyond that this is a fan base that has been burned time and time again by ownership. Plus, it’s Miami…there are many other things you could be doing on a Friday night other than watching a baseball game. In the heart of downtown Miami is this brand new baseball stadium. It’s great and I think everyone should check out a game there. The food was good. The weather will always be perfect. There is plenty of legroom in the seats for 6’7 fans like me. But what happened on that night is, I think, an apt metaphor for where the Marlins are right now. On that night I walked into a stadium that looked great, but was dead inside. The Marlins have several bright young stars who bring optimism, but there isn’t enough substance in the organization to bring success yet. Hopefully one day the experience and the ball club will match the shiny exterior of a new ball park and a few big name stars.